Look younger and fresh-faced today - take the RevitaLume challenge! Dark under-eye circles can make you look old and tired. They affect the way people look at you, and worse, the way you feel about yourself. Even worse - dark circles aren't even your fault. They're caused mostly by genetics and heredity. So what can you do about those stubborn dark circles? RevitaLume can help. 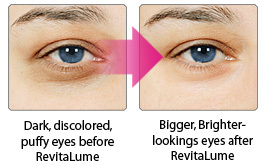 RevitaLume can smooth away even the darkest under-eye circles. Powerful ingredients go to work right away to brighten the skin, making you look younger and wide awake -- ready to seize the day! Try RevitaLume for 2 weeks. If you don't get at least 5 compliments on your new appearance, we'll make sure you never pay for RevitaLume. Take the RevitaLume challenge today -- you've got everything to gain, and nothing but dark circles to lose! © 2019 DarkCircles.net. All Rights Reserved.